Large 18C Chinese Porcelain Bowl Doucai Water Birds Flowers Antique 19CM. 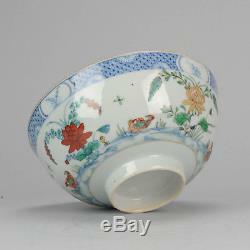 A high quality doucai porcelain bowl, decorated with water birds and flowers. Overall Condition B; 2 hairlines and a fritspot. Size; 190mm diameter and 90mm high approx. 18th century Qing (1661 - 1912). You can follow it at. The item "Large 18C Chinese Porcelain Bowl Doucai Water Birds Flowers Antique 19CM" is in sale since Thursday, April 05, 2018. This item is in the category "Antiques\Asian Antiques\China\Plates".